Now, 31 visitors are online. Oval cemetery plaque. To stick on the headstone of the grave. Engraved photo of a dog. 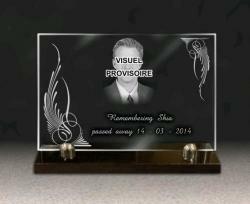 A memorial plaque for a late animal. Adhesive to be glued on a headstone. There exist cemeteries for animals. When we live with a pet for a long time, we want a burial ceremony for it, as for a family member. Then it is possible to make a marker for this pet. The model here is an oval adhesive plaque. It is a vertical oval. To stick it we use an elastic glue. It is outdoors resistent, and is not going to fail because of temperatures. The adhesive is pre installed at the back of the plaque. Be carefull, the support has to be flat, dry and smooth. If you try to settle it on a wet surface, or an irregular support it will fail. Plus, Renaud Gravure guarantees it to keep being glued on a smooth suppport as marble, franite, glass, but not on porous supports. Otherwise we suggest a tube of silicone, but still not as resistent as our adhesive. 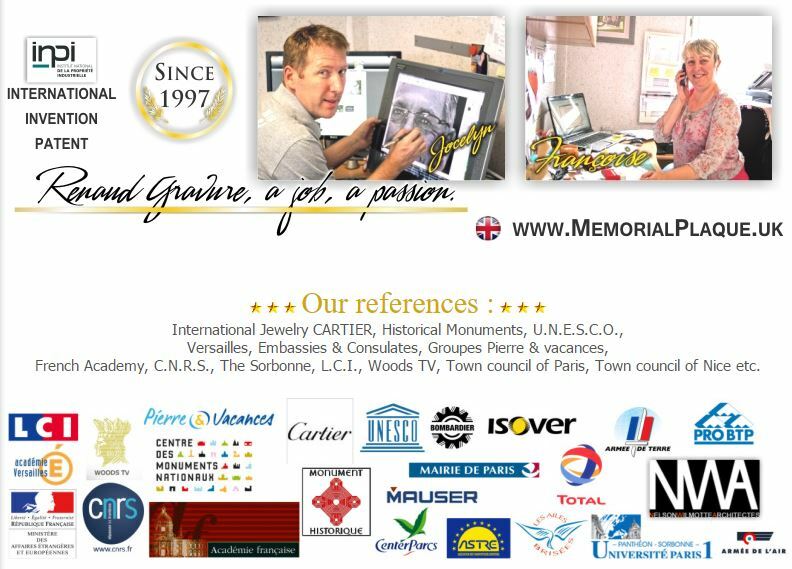 It is important to keep this information, because we want you to buy the suitable plaque. It is a polished plaque. 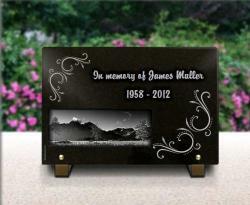 Either it is for humans or for animals, we provide the same material, a black granite plaque that is polished. 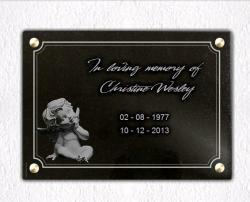 It is an oval black granite plaque. There is no hole or feet because it is an adhesive plaque. The oval is vertical and measures 20cm x 30cm. At the top there is in a circle a photo of a dog, a young Labrador. It is layed on the floor and its face is turned to the right. It is its profile ; its two front legs are in our direction. Behind it, we can see some shelves. It is a photo from our catalogue. 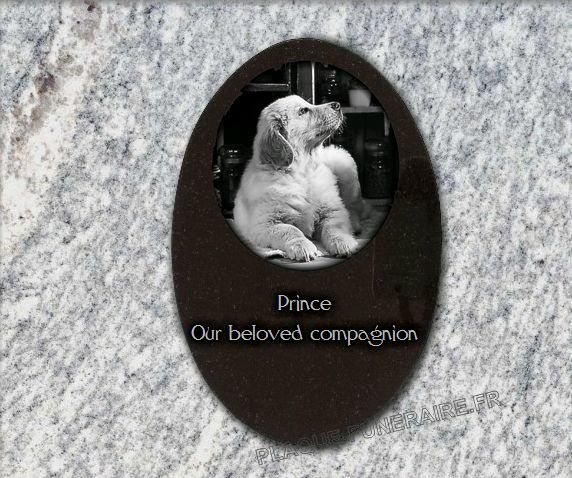 Below this photo, there is a two-lines-text "Prince Our beloved compagnion". - The plaque : " Plates", "Black granite plates". Click on the third thumbnail "Plaques adhesives", and valid with "plaques blank". - The dog : "High definition drawings"; "Create drawing #1". In the menu on the right, please select the category "dogs". Here you will find this particular dog. 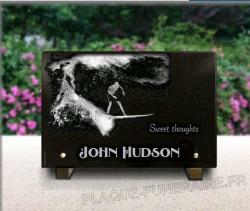 If you want to add yours, go on "Photos, engraved portraits" ; " Create engraved photo #1". Follow the instructions. - The text : "Texts" ; "Create text #1". Here write in the relative space your text, change the writting style in "2: Letters' shape" and choose "Style 6". To have the same result in the third thumbnail "3: Size, position and rotation" Character size :27 ; Horizontal -72 ; Vertical position 20 ; Line Spacing 30.